Tour of Sufferlandria 2014: Race director and Sufferlandrian local hero, Grunter Von Agony challenges you to 9 days of hell in The Sufferfest’s Grand Tour. If you are looking for something to motivate your winter training then committing to The Sufferfest Grand Tour could be just the ticket. Taking part in the 2014 Tour of Sufferlandria is easy. Well, the riding isn’t easy but entering is! Simply ride the set video each day and that’s it you’re riding a Grand Tour Sufferfest style! But even the minions at the Sufferfest don’t want you to suffer so much as to train on your own, so why not join the community over at the Race Village on Facebook? Join the community over at the Race Village on Facebook? Need more motivation? As well as helping people living with Parkinson’s there are some amazing prizes to be won! To be in with a chance to win a prize be sure to make a donation of at least 10 US Dollars to Davis Phinney Foundation for Parkinsons. 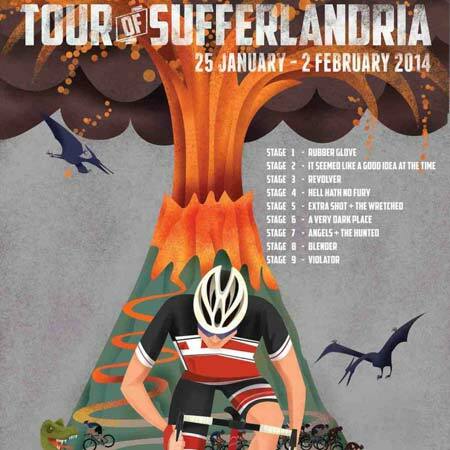 Tour of Sufferlandria: Good For Winter Training? There was some good debate recently on our Winter Cycling Training post about whether using Sufferfest videos might be too intense during a period of traditional “base” mileage. My own personal take? Life’s busy and making the most of the limited time we have to train makes high intensity workouts a very effective way to train muscle and heart tissues to work more effectively. Add in the peer pressure and the fear factor created by an upcoming big training block such as the Tour of Sufferlandria and for me it’s a no brainer. I need to be scared to work hard and that’s also why I enter sportives regularly to keep me scared and training! I’ll be riding The Tour of Sufferlandria. Will you? 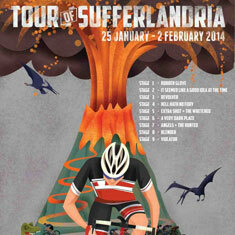 Image Credits: Like the 2014 Tour of Sufferlandria official poster by Melbourne-based artist Gregory Baldwin? Buy it now on Red Bubble.